and join me in my caves." and far too fond of water. So, with a sassy "Pardon me"
and frolic with an otter. "the sea will surely rot her." © 2011 Kurt Cyrus. All rights reserved. Kurt Cyrus has the type of mind I love. I mean, what type of crazy brilliant mind comes up with a mummy in love with a mermaid and then rhymes otter with rot her? Right. The type of mind I love. Just like last time he was here and gave us The Big Snore, I simply love his ability to create utterly unique turns of phrase and make me laugh. Beyond his delicious way with words, Kurt Cyrus also has a remarkable way with pictures. His illustrations, whether he's written the book or someone else has, are remarkable. Check out his books or even the outtakes page on his website and you'll see what I mean. 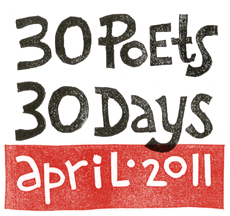 I doubly admire the double threats among us, and that means I'm doubly happy to have Kurt Cyrus here today as part of 30 Poets/30 Days. We had three tanka from Nikki Grimes earlier today. Tomorrow kicks off with Linda Sue Park with Explaining Baseball to an Alien! For more on 30 Poets/30 Days and ways to follow along, please click here. I really enjoy Kurt Cyrus' poetry! This man thinks outside the box. And I love it!!!!!! Thanks so much for this gem! This poet is definitely someone I would love to read.